It’s the last stop before the Elimination Chamber – what’s to become of John Morrison’s spot if he’s unable to compete? That’s all I got. I’m still half asleep. Anyways, it’s Friday (for another 10 minutes as of the time I’m typing this very sentence), and I’ve got SmackDown fired up and ready to go! “Do you really wanna cross the line?” No, WWE, no we don’t. Especially after TNA moves to Mondays head to head with RAW starting March 8th. We’re live in Kansas City, MO, and Todd Grisham tells us that we’ll see a Chamber of Horrors this Sunday at the Elimination Chamber. I hope he means that metaphorically. We don’t need another actual Chamber of Horrors match – but that’s some other wrestling site’s job to talk about that Crap, so I digress. Tonight on SmackDown we’ll see Royal Rumble winner Edge taking on The Animal, Batista. The Rated R Superstar, Edge makes his way to the ring. He tells Jericho that it’s refreshing to hear that Jericho understands what a big deal is to beat The Undertaker. Edge knows, he’s done it. It’s like winning the Stanley Cup or knocking out Muhammad Ali, but Jericho did it. Jericho says it’s because he’s the best in the world at what he does. Edge says that’s the problem. Jericho left some details out. Edge shows what really happened – he speared The Undertaker, leading to Jericho’s victory. But Edge didn’t do that to help Jericho, he did that because Undertaker kicked him in the face. That’s the problem with Jericho, he’s not as good as he thinks he is. He wouldn’t have beaten The Undertaker if Edge hadn’t speared him first. Jericho says he should worry more about the future than the past. It’s axiomatic, he’s going to win the Elimination Chamber. Edge should do himself a favor and face the RAW Elimination Chamber winner, because bad things happen when Edge is around Jericho. He’ll hurt Edge if Edge comes after him. Edge says that the more he hears Jericho’s voice, the more he wants to knock that condescending, holier than thou look off of his face for good. Edge hopes Jericho wins so he can do it. He shouldn’t be concerned about what he can do to him in the future, he should be concerned about what he can do right now. The lights flicker, and Edge spears Jericho. WWE Rewind: Drew McIntyre and Kane battled to a double count out last week. Kane left McIntyre lying after a chokeslam following the match. Speaking of Kane, The Big Red Monster is in the house and ready for action. This Sunday, he’ll be facing Drew McIntyre for the Intercontinental Championship at Elimination Chamber. Dolph Ziggler is still alive and still employed, for those wondering, and he is, in fact, Kane’s opponent for tonight. After the match, McIntyre tries to sneak up on Kane and hit the FutureShock DDT, but Kane escapes via a backdrop, sending the Intercontinental Champion scurrying away. Josh Matthews asks Rey Mysterio about his chances in the Elimination Chamber. Mysterio says it’s dangerous, but that last week he took the beating of a lifetime from the Straight Edge Society. He’ll probably take another one on Sunday, but he’ll walk out World Heavyweight Champion. 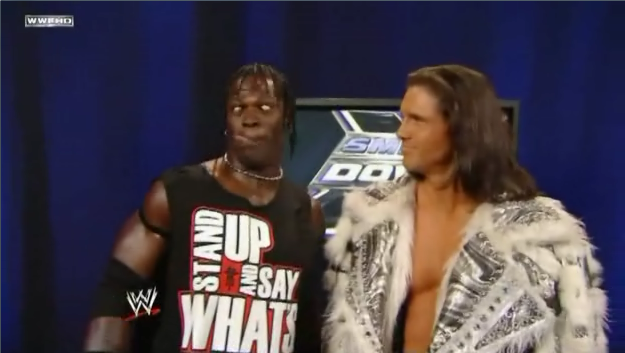 Still to come tonight, John Morrison and R-Truth take on the Straight Edge Society. This past Tuesday: Ezekiel Jackson wins the ECW Championship in the brand’s final match, with a little help from William Regal. Jackson is coming soon to Friday Night SmackDown. Already here on Friday Night SmackDown, however, it’s the Homeboy Shopping Network from In Living Color. Oh no, wait, it’s just Cryme Tyme. Their opponents are apparently now officially a part of the SmackDown roster, Trent Barreta and Caylen Croft. I’m a fan of Croft and Barreta from watching them on ECW, glad to see them on the SmackDown roster. They don’t fare too well in the early going, however, as JTG uses his quickness to the early advantage. Barreta distracts JTG momentarily, allowing Croft to dump JTG over the top rope. Barreta and Croft take over, using frequent tags to their advantage and keeping JTG caught in their corner. JTG finally causes some separation and gets the tag in to big Shad, who turns the tide into Cryme Tyme’s favor. He hits a powerslam on Barreta, but the pinfall is broken up by Croft. Things get crazy for a second, and Barreta hits a missile dropkick on Shad. He goes for a tornado DDT, but Shad uses his power to avoid it, then hits an STO for the victory! WWE Hall of Fame Inductee: Japanese legend Antonio Inoki joins Ted DiBiase in the 2010 Hall of Fame Class. The Straight Edge Society are here, as Serena accompanies CM Punk and Luke Gallows to the ring for their match. Last Friday, Rey Mysterio beat Punk, but got beaten down for his trouble. Punk takes the microphone. He says he’s a humble man, but let’s face it, he’s the greatest thing to ever happen to you people, and you know it. Sure, only the enlightened few can walk in his footsteps, but whether you like it or not, you’re all a part of his crusade. For those of you who choose to live in darkness and stand in his way, Punk finds your lack of faith disturbing. You confuse defiance with power. You sacrifice clarity for cheap thrills. Just like five other Superstars will be locked in the Elimination Chamber this Sunday with Punk, he’ll break your spirit. He’ll spill your spirits onto the floor and fill the void with Straight Edge. You can all pretend you don’t have a problem, but you’re lying to yourselves. Straight Edge means that Punk is better than you, and he’ll prove it to everybody just like he did Rey Mysterio last week. Punk’s entire existence, he’s fought in a way that you cowards don’t have the courage to stand and fight. The fire inside him fuels him, and This Sunday, he’ll become a four time World Heavyweight Champion, and his crusade will be burning bright. All of the lost souls in the WWE Universe will have a savior, and his name will be CM Punk. Straight Edge Society in action, NEXT! John Morrison is out first for his team, and he seems to be walking just fine. R-Truth really needs to write a new song. I mean, if I went to a concert and the band only played one song over and over again, I’d be mad. Besides, doesn’t he ever get tired of singing that same song every time he comes to the ring, 200+ days a year? The Straight Edge Society have finally taken over on offense as we come back. Gallows and Punk, like Croft and Barreta did to JTG earlier in the night, have trapped Truth in their corner and utilize frequent tags to keep a fresh man in the ring. As I often say, Gorilla Monsoon would be proud. Truth manages to get away from Punk momentarily, but the crafty Punk stays in between Truth and Morrison, kicking Truth in the head and dragging him back to the Straight Edge Society corner. You know, I just noticed that Gallows is essentially wearing Sgt. Slaughter’s old ring gear. Truth manages to take Punk down long enough to get the tag in to Morrison, who turns things around for his team. Morrison and Punk spill out onto the apron, and Morrison goes for a roundhouse kick – but smashes his own ankle into the ring post as Punk ducks. Punk capitalizes, going after the injured ankle of Morrison until the referee calls for the bell. After the bell, Punk attacks Morrison’s ankle again. Truth tries to help, but Gallows attacks him from behind. Before any major damage could be done to Truth, Rey Mysterio runs out and makes the save – but he’s probably wishing he hadn’t, because Punk takes him down as well. Gallows hits a backbreaker on Mysterio as Punk climbs the ropes. He drives a knee into Mysterio, echoing the old Demolition Decapitation Elbow, just, y’know, with a knee. Punk kneels over Mysterio as the Straight Edge Society stand tall in the carnage they’ve left. This Past Monday: Bret Hart tries to walk out of the WWE, but gets his leg caught in a car door and has to be carted out in an ambulance instead. Todd Grisham confirms that Bret Hart has a broken left leg. Still to come, Edge takes on Batista in his first singles match since his return. On a monitor, we relive Vickie Guerrero getting covered in Cottage Cheese last week, much to the delight of Teddy Long. Vickie asks him if he thought it was funny. Long says it’s not, because she doesn’t need any more cottage cheese. Vickie says it’s a shame that Shawn Michaels didn’t leave a boot print on Long’s chin, it would be an improvement. Long says he’s taking action against Shawn Michaels. Mickie James rushes in and wants to have a word with Vickie. She wants to apologize. She didn’t mean to humiliate Vickie Guerrero and she’s sorry. Vickie says she’s sorry, because Mickie has to defend the Women’s Championship next week on SmackDown against Michelle McCool. Mickie says she’s fine with that. Vickie says there’s a special guest referee – herself. Fatt Lardy, The Great Khali, and Maria are accompanied by Ranjin Singh, and they’ll be in six person mixed tag team action. They’ll be taking on Natalya, Tyson Kidd, and David Hart Smith, the Hart Dynasty. Can we please, please, please, please, please not have the extremely talented Hart Dynasty job to random team #29792734 again? Natalya starts off the match by dominating Maria quite easily. Maria actually manages to turn things around, but Natalya gets the tag to Tyson Kidd, meaning that Maria has to get out of the ring as well. Matt Hardy comes in and takes control for his team, but Kidd gets the tag in to Smith. Given how much crap I give Hardy on this site for the tights he started wearing around WrestleMania last year, I should note that he’s gone back to his old look, perhaps finally taking the hint. Anyways, the Hart Dynasty start working over Hardy, but Hardy manages to nail a Side Effect on Smith, crawling over and trying to make the tag, but Smith knocks him out of the ring, and he inadvertently tags in Maria on the way out. Natalya nails a tornado clothesline on an unsuspecting Maria and picks up the victory for her team. Matt Striker makes a Molly Hatchet reference (“We’re traveling down the road and flirting with disaster”) and throws us to an Elimination Chamber video package. Up next, the Rated R Superstar, Edge, takes on The Animal, Batista! Maria doesn’t want to talk about losing the match for her team. Matt tells her it doesn’t matter, he’s lost matches before. He goes to kiss her, but Michelle McCool and Layla tell them to get a room. They ponder why neither of them can make a relationship last or win a match. Maria pushes through them. Matt tells them to grow up before pushing through them himself. Batista is out first for his match, and he does the same entrance he did last week – no pyro, no video wall, just a spotlight leading him to the ring. He faces Edge in our main event, NEXT! Batista is still waiting in the ring, and we re-live his comments to John Cena from RAW. Edge finally makes his entrance, and we’re set for action in our main event! Edge is still in control when we come back, but not for long. Batista catches a rushing Edge with a boot to the face and takes over. He sets up the steel steps on the outside and goes for a Batista Bomb, but Edge backdrops Batista onto the steps instead. Edge gets back in the ring, but not for long, he nails a running clothesline from the apron to the floor on The Animal before rolling him back into the ring. Edge gets caught coming back into the ring, but Batista can’t keep the advantage as Edge takes him down for a two count. Edge goes for a spear, but he gets caught with a spinebuster, giving Batista a two count. Edge hits the Edgecution for a two count. The Rated R Superstar climbs the ropes, but Batista sends him crashing down. Batista charges in, but Edge hits a spear. The lights go out, and when they come back on, Edge finds himself chokeslammed by the World Heavyweight Champion, The Undertaker. Batista gets the hell out of dodge, and The Undertaker gazes back down the ramp towards the man with a guaranteed title shot at WrestleMania, Edge. Edge looks back up the ramp at The Undertaker, then turns around into a Codebreaker from Chris Jericho, who came in through the crowd. Jericho looks up the ramp at The Undertaker, and motions that he’s going to be taking home the title this Sunday at Elimination Chamber. Hi, do you or someone here know where i can download some celeb nail designs? Your way of describing the whole thing in this piece of writing is truly pleasant, every one can effortlessly know it, Thanks a lot. I know this web page presents quality based articles or reviews and extra data, is there any other site which offers these things in quality?